The calories in a coffee come mainly from the added milk or from the added sugar. The volume of the average small size coffee is about 300 ml. The volume of coffee that is that cup is only 20ml per shot, so the rest of the cup is made up of milk. To determine the number of calories in each of these coffees we need to know the volume of milk used and the type of milk used. A small coffee drink will use one shot of real coffee, a medium two shots, and a large will use three shots. That means that when you order a ‘small’ serve, which is approximately 300ml, the milk content in each cup of coffee is around 280ml. That’s a lot of milk. A ‘medium’ coffee is 400 ml, and a ‘large’ is around 550ml. That equals 360ml of milk for the ‘medium’ and 490 ml for the ‘large’. Full cream milk contains approximately 65 calories per 100ml. Skim milk has approximately 35 calories per 100ml. Because of the large volume of milk used in these drinks, it is important to choose the fat content of the milk wisely. If you go for a full cream milk coffee, rather than a skim milk coffee, there will be a big difference in the number of calories consumed. There will also be a big difference between a small and the larger serves. Sugar added to your your coffee is another source of extra calories. Each serve of sugar contains about 15 calories. Drinking one cup of coffee per day, with one added sugar, will add 105 calories in one week. If you regularly consume two coffees per day and have two sugars then it’s 420 calories per week. That is equivalent walking for one hour. So a very easy and obvious way to reduce the calories in your coffee is to stop adding sugar. You can of course use an artificial sweetener. And don’t be fooled into thinking ‘natural’ or brown sugar is any better than white sugar for calories: it isn’t. So what are your options if you really love your coffee? Go for a smaller serve coffee: if you change from a medium to a small coffee, you’ll save 50 calories for a full cream coffee and 28 calories for a skim milk coffee. In one week, at just one coffee per day, that equates to approximately 350. Go for a skim milk coffee: if you switch to a skim coffee, you’ll be decreasing your intake by 84 calories for small serves, 108 calories for medium serves, and a whopping 147 calories for large serves. 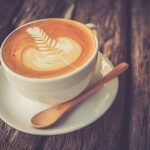 Stop adding sugar to your coffee: the calories from sugar can really add up, and sugar is just empty calories. You can quickly get used to using an artificial sweetener. Go for a long black coffee: if you really want to reduce your calories from coffee then a non-milk coffee is the best option. You can try a short espresso shot or a long black coffee. You’ll get to really taste the coffee and save yourself thousands of calories each year.